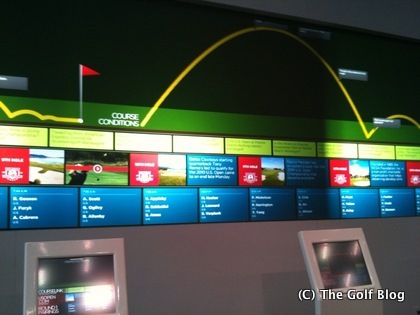 The Golf Blog » Blog Archive » The Golf Blog: USGA allows tweets from U.S. Open @ Pebble Beach, for real!? The Golf Blog: USGA allows tweets from U.S. Open @ Pebble Beach, for real!? mulligan, 15 June 2010, Comments Off on The Golf Blog: USGA allows tweets from U.S. Open @ Pebble Beach, for real!? The Golf Blog says: It’s hard for golf to get rid of its “stodgy,” “old man’s” image. Originated by men in Scotland back in the 15th century, golf surely has earned its reputation as a “gentleman’s” game where tradition matters. So when The Golf Blog received an inquiry asking us to go to Pebble Beach to tweet the U.S. Open, we shook our heads. The person who asked us didn’t know any better, we thought to ourselves. She wanted us to tweet the most prestigious major championship on the golf course while the tournament is happening. Haha. Right. “We don’t think the USGA will allow cellphones on the course,” we kindly told her. Much to our surprise, she told us that’s right (cellphones aren’t allowed on the course), but she (consulting for sponsor American Express) had received approval from the USGA to allow a few people to bring cellphones onto the course — and, even better, tweet from the course!! Wow, now we were impressed. That’s not all. 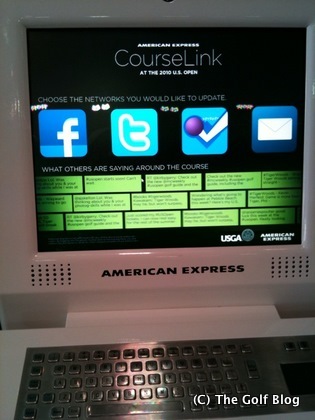 Even the general public (without cellphones) can tweet from the course using the kiosks that American Express has set up on site. It gets even better. There’s a giant video display with live Twitter feed of posts (with the #amexgolf tag) for spectators to follow the tweets. People at home can view the Twitter feed on the US Open website by clicking here. You can also download the free USGA US Open iPhone app and follow tweets there! Kudos to the USGA for embracing new technology! Hopefully, we’ll be able to post a few photos of the tech setup at the U.S. Open. Stay tuned. This is going to be good! If you want to follow The Golf Blog’s tweets directly, click here.